Well, it may be time to stop focusing on what hasn’t worked and start paying attention to what is working when it comes to digital couponing. The fact is, many of today’s hyper-growth brands are using digital coupons as a core part of their growth strategies — Uber, Dropbox, and Blue Apron have all utilized coupons and offers with great success in today’s connected marketplace. So how to avoid the pitfalls and use coupons effectively in today’s rapidly changing landscape? Learn from what some of today’s smartest brands are doing right with digital coupon marketing. One of the incredible growth stories of the past few years has been Uber, which has grown from inception to over 1 million daily rides given in the span of six years. A little known fact is that part of Uber’s growth was fueled by the smart use of discount codes. The ride-sharing app’s genius is in making their coupons social and viral from the ground up – every Uber user is given a referral code to refer new riders, and both parties receive a free credit when the new rider signs up. Uber employs the same strategy to sign up new drivers with great success, with a $100 credit given to drivers who referred new drivers. Other hyper-growth companies such as Dropbox, Airbnb, Evernote and ClassPass have used shareable referral codes to leapfrog their competition. The key is to think of coupons as an integral part of your social marketing strategy rather than as an isolated segmentation strategy for deal seekers. Only 2% of customers complete a transaction the first time they visit your website. Retargeting is a powerful way to bring the other 98% back to complete the sale. Because retargeted ads are seen only by those customers who have indicated an interest in buying from your site, incorporating a discount within your retargeting ads can be a powerful way to close the sale. 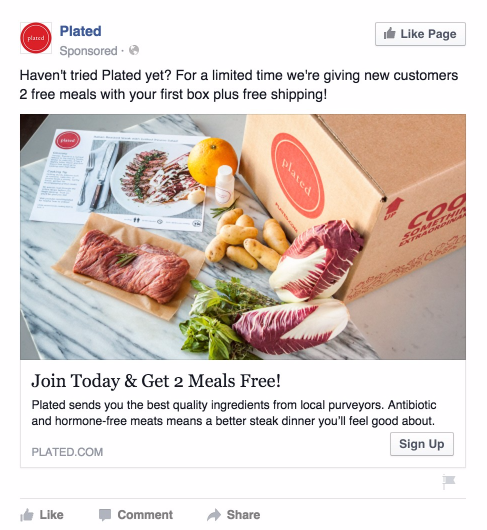 Plated incorporates offers for free meals in its retargeted ads on Facebook. For subscription services requiring more time and thought prior to a final purchasing decision, retargeted ads with discount offers can be highly effective. You already apply personalization to your site and email campaigns (if not, this should be your priority). Why not take it a step further and include discount offers as a part of your personalized marketing campaigns? 80% of consumers say they want promotions that are tailored to their own personal needs and preferences, which may seem obvious, but many brands do not take advantage of this opportunity. Differentiate from your competition by offering tailored discount opportunities which are likely to delight your customers. 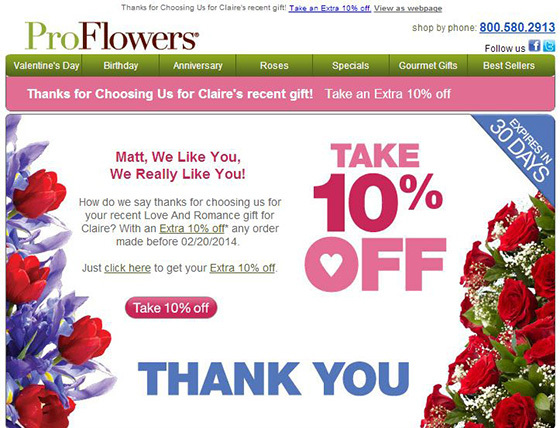 ProFlowers utilizes information about your significant other to customize a discount offer in a highly personalized message. The company could also use information it collects about birthdays, anniversaries, as well as holidays to offer additional targeted coupon offers which are likely to perform well. 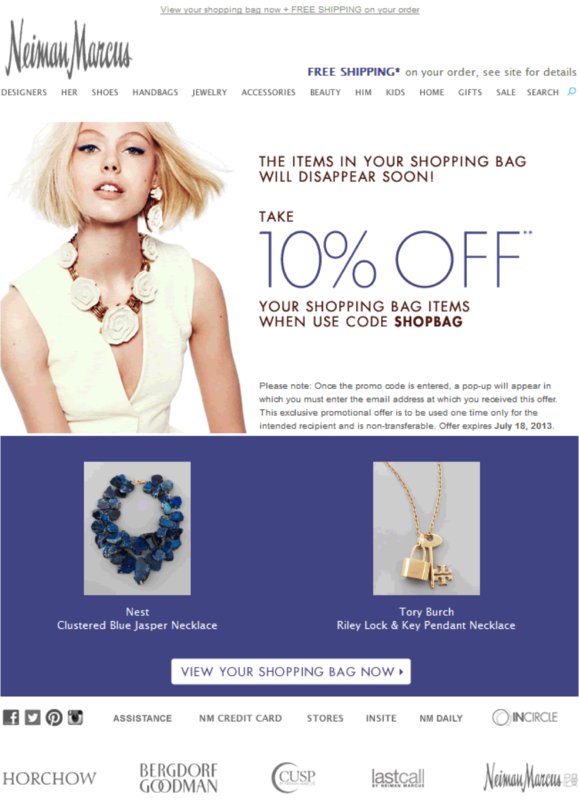 So you’ve succeeded in getting the customer to your site, and they’ve even added items to their shopping cart. Well, did you know that 68% of shopping carts are abandoned, meaning they were populated with items but the shopper left them without purchasing? Neiman Marcus does an outstanding job of sending customers a targeted coupon in cases where a shopping cart was abandoned. This is an example of how a targeted use of a coupon can not only drive sales but can provide a great experience for your customers. With TV viewership down, ad blocking on the rise, and 3% of people generating 90% of online impact its no wonder that influencer marketing is one of the most effective marketing strategies today. While online coupons and influencers may appear to live at the opposite ends of the marketing spectrum, giving your brand ambassadors discounts to give to their followers is one of the most effective ways to drive influencer campaign performance. 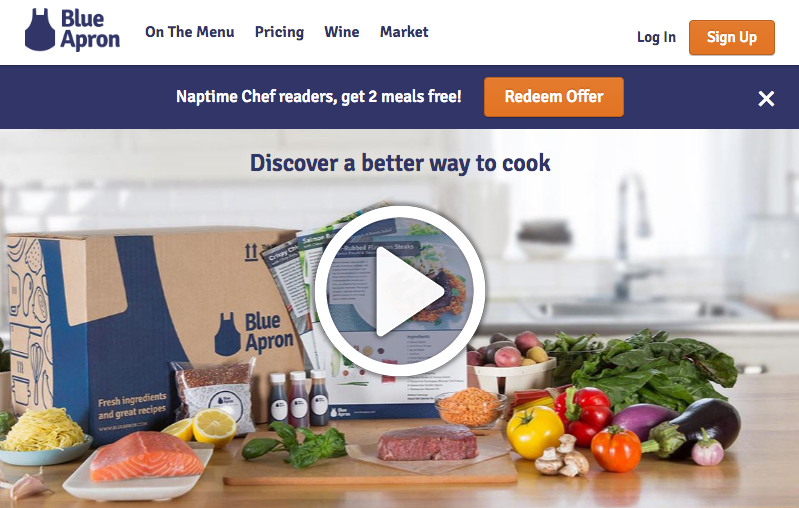 Blue Apron provided its blogger ambassadors with discount links good for 2 free meals to give out to readers. This not only helped to drive up conversions, it gave their influencers additional credibility as official ambassadors of the Blue Apron brand. Influencers on social media sites like Instagram, Twitter and Pinterest can also drive significant brand interest and leads. More specialized vertical platforms catering to shoppers hunting for deals can be particularly effective for reaching motivated shoppers looking for good values. 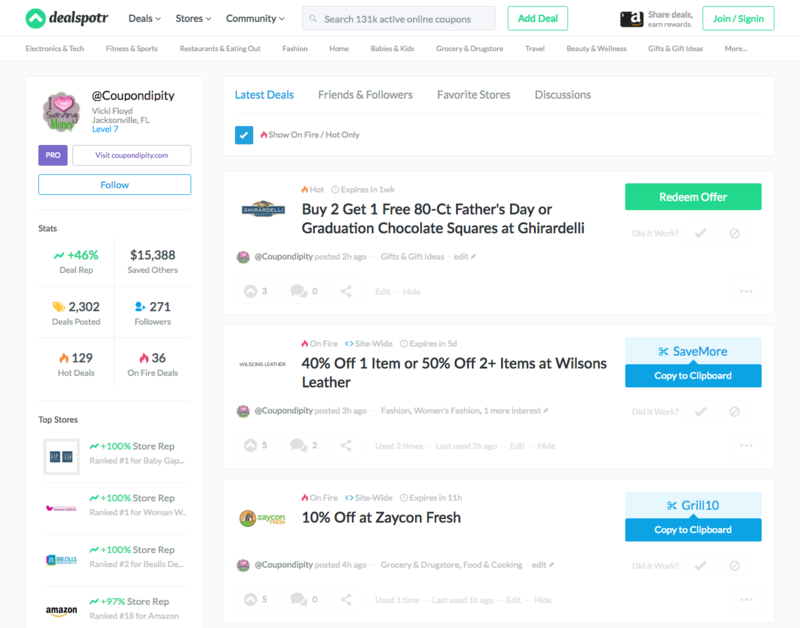 Brands can work with top influencers on sites like Slickdeals and Dealspotr to drive awareness of coupons and special offers. On sites like these, power users with large followings can easily sell out brand offers with a single post. So there you have it. You can see that smart brands are taking an old concept in couponing and applying it in creative new ways to drive sales and build engagement with customers. Like these successful brands, you should think of coupons as a natural extension to your overall marketing strategy, and apply them in your efforts to provide more social and personal experiences for your customers.